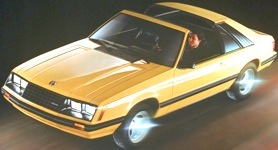 1982 New to 1982, was the Mustang GLX which replaced the previous years luxury Ghia options package. The GLX has "blackout" treatment on exterior window trim and door handles; optional non-functional hood scoop; P185/75R14 BSW performance tires; 6 spoke cast aluminum wheels, 5.0 fender badges; 157hp 5.0L V8 engine and GT handling and suspension; GT dash instruments; reclining low bucket seats; blackout dash; and optional console with armrest, electronic digital clock and graphic display systems monitor. The new 1982 Mustang line-up of base level L, GL upgrade, luxury-sport GLX, and sport GT was created to follow the European naming standards for easier export. 1983 The 1983 Mustang GLX luxury package was mainly different from the base GL on the inside with dual bright remote control mirrors, wood grained trimmed 4-spoke steering wheel, metal rocker panel trim, driver's door map pockets (the passenger was not allowed to read maps), and lighting group. The GLX convertible included power brakes, tinted glass, black remote mirrors, black rocker panel trim, and automatic transmission. 1983 was the second and last year of the GLX. In 1984 both the base level GL and GLX was combined to form the base level LX.